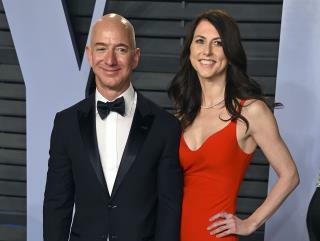 (Newser) – Jeff Bezos tweeted Wednesday that his divorce from wife MacKenzie Bezos is coming after a "long period of loving exploration and trial separation." It also apparently comes after a period of Jeff Bezos dating former TV anchor Lauren Sanchez. Sources tell Page Six that the Amazon founder became close to Sanchez after she separated from husband Patrick Whitesell last year. The sources say Bezos and Sanchez got to know each other through Whitesell, a talent agent whose clients include Hugh Jackman and Matt Damon. Sanchez, 49, married Whitesell in 2005, People reports. She co-hosted Fox's Good Day LA from 2011 to 2017 and was the original host of So You Think You Can Dance. Well, Jeff, that was fast getting the next gal.